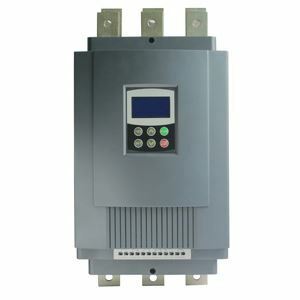 15 hp AC motor soft starter, 11 kW three phase 230v, 400v, 480v, 690v motor starter. Model GS2-011 (230v), GS3-011 (400v), GS4-011 (480v), GS6-011 (690v). Tips: Should I use a soft starter? Applications which just need to control inrush current can do with just a soft starter. Variable torque, constant torque applications will need a variable frequency drive (VFD). A VFD can be prohibitively expensive for large loads, so soft starters are used there as well. VFDs have the potential to cause Electromagnetic Interference while soft starters don't. MV applications use soft starters a lot. Of course a VFD is more versatile than a soft starter and a VFD normally has built in all of soft start functions.